Petra is one of the most famous historical archaeological sites. The term Petra has been derived from a Greek word ‘petros’ that means ‘rock’. This ancient city was located between the Dead Sea and the Red Sea. It was situated in the modern day Jordan. The city was built and ruled by a tribe called the Nabataeans. They were the ancient southern Arab people. It was their capital city. Half part of the city is man-made and the remaining half is carved into the rock. This city is also referred as ‘Rose City’ because of the rose-red color of the rock. Petra was classified as a UNESCO World Heritage Site in 1985. It was established in 312 BC that makes it one of the oldest cities in the world. There are more than 800 carved tombs in the city of Petra. 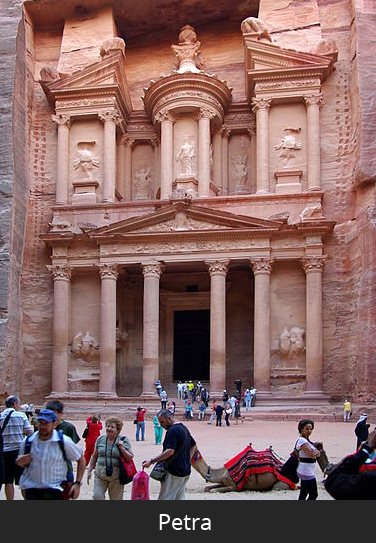 A Swiss explorer named Johann Ludwig Burckhardt introduced Petra in 1812. Before that, it was unknown for about 5 centuries. The Nabataeans were worshippers of the Sun. These people also built an altar on the top of their house. There is a narrow canyon of about 1 kilometer at the entrance of the city Petra. It is bound by about 80 km tall cliffs called Al-Siq. The most part of the city was damaged in May, 362 AD by severe earthquakes. Many buildings and the city’s vital water system was damaged. The city was made in three different periods: -the Edomites, the Nabataeans, and the Romans. Petra is believed to have been home to about 30,000 people once. The Nabataeans were excellent carvers, plumbers, and stonemasons. They were also skilled at commercial trading. They were efficient water collectors and able to grow lush gardens in the area. Petra was famous for both the spectacular buildings and the water conduit system. Only 15% of the city has been explored by archaeologists. Rest of the city is yet to be discovered. This ancient city was captured by Muslims in the 7th century and by the Crusaders in the 12th century. Declan, Tobin. " Fun Petra Facts for Kids ." Easy Science for Kids, Apr 2019. Web. 18 Apr 2019. < https://easyscienceforkids.com/petra-facts/ >.